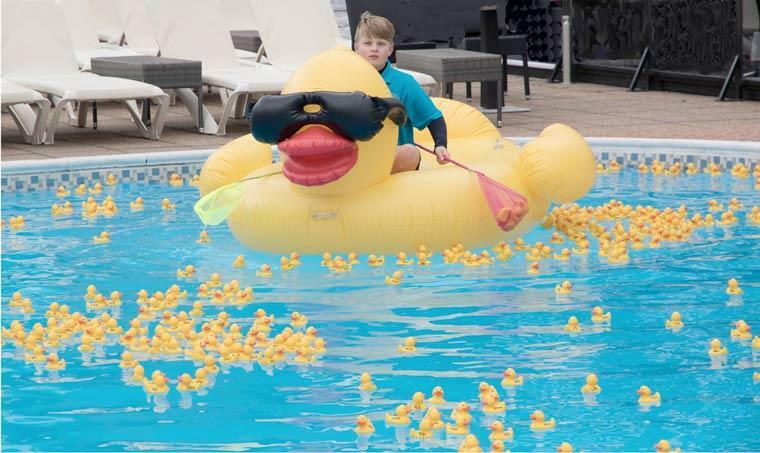 People flocked to Bournemouth’s Cumberland Hotel on 17 September to see 800 rubber ducks floating in its outdoor pool waiting to be netted for charity. The ducks – and visitors – at the Cumberland Hotel were there for a charity ‘Net a Duck’ event with a difference. Each of the ducks was numbered and scooped its winner a prize, ranging from tickets to an attraction, to a top hotel stay. And by the time the last duck had been captured, £3,590 had been raised for Macmillan Caring Locally and the Bournemouth Hospital Charity. The Cumberland teamed up with the Marsham Court Hotel to stage the wacky event. Rosie Wallace, manager of the Marsham Court, said, “When Kevin Wood from the Cumberland first came up with the idea for this I thought it was totally mad and never dreamed it would be such a success. It cost £5 to net a duck and each one represented a prize worth at least £5. Natasha Granville, 49, was thrilled to find her little yellow friend had won her a night’s stay at the Ocean Beach Hotel worth £99. She said: “It’s a really wonderful idea and such great fun, no matter how old you are.